Which was Your Deer Park? Which rendition of this landmark captures your fondest college or local memories? All of these prints by Larry Anderson are currently just $20 unframed in our gallery. You've Been Framed has an extensive selection of local art and if you don't see what you're looking for, we can probably order it for you. Wow! 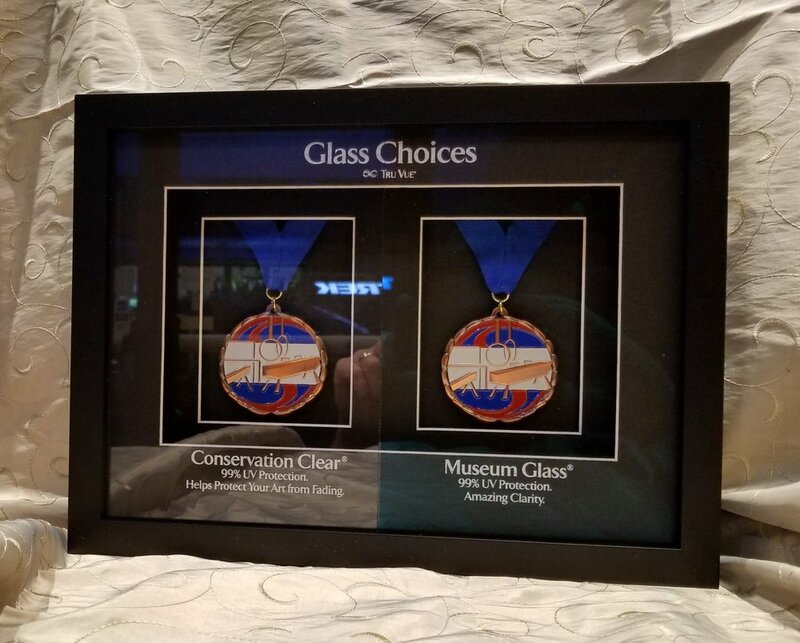 What a difference Museum Glass can make to your darker or more intricate images that we frame for you as well as three-dimensional items that you need shadowboxed. The reflecting Trek Bicycle store's neon sign across the street and my hand aiming my phone provide the best examples of how the technology inherent in museum quality glass reduces reflection while adding clarity significantly. Notice how it disappears when it reaches the pane of Museum Glass on the right. For a limited time, show this Facebook post and receive 15% off Museum Glass if you choose to upgrade. Remember those gum wrapper chains made popular in the 60's? A customer of ours came across this impressive specimen made by his mother in HS tucked away for no one to see. 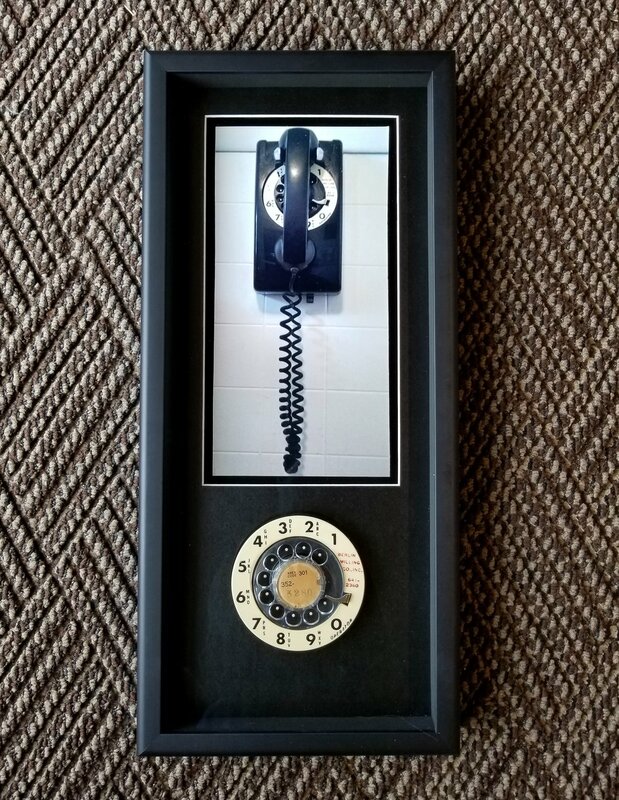 Recognizing its beauty and significance and thinking it deserved more recognition, he had it shadowboxed into wall decor as a special gift. Youve Been Framed is experienced in turning all your heirlooms into lasting gifts of quality. Sharing your comments and photos on Google and Facebook confirm our dedication to providing quality service. Thanks for you patronage and continued support. Maintaining a service business on Main Street for close to 40 years is only possible with happy customers like you. W. James McGlynn's "East Main Street, Newark, DE" was painted in 1993 and yet, except for the removal of the bank behind the famous clock (left), the first few blocks including the Methodist church have seen little change. The signed and numbered print is currently available at our shop for $80, just in time to winterize your home. Dad's woodworking tools; too cherished to ever use and too important just to tuck away. SOLUTION: Shadowbox them to preserve for generations while sharing their relevance to everyone today. Whether it's military medals, a sports jersey, letter sweater, Christening gown, or something as special as your mother's sewing kit or perfume atomiser and compact, let You've Been Framed create the perfect display of your most cherished family heirlooms today. One of our matboard manufacturers join Sherwin & Williams in announcing the 2019 color of the year. You're sure to see its prominence in new fashion designs, home decor, and accessories. Preserving your children's art through the years certainly brightens any room but also celebrates their accomplishment and builds confidence. Studies show children that explore and experience success in the arts perform at a higher level in their academic endeavors. These white shadow box frames add interest and depth to colorful but otherwise flat childrens art. The collection makes a stunning statement and backdrop for a child's play area.